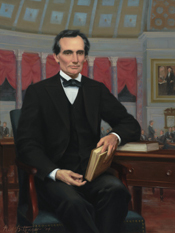 LINCOLN, Abraham, a Representative from Illinois and 16th President of the United States; born in Hardin County, Ky., February 12, 1809; moved with his parents to a tract on Little Pigeon Creek, Ind., in 1816; attended a log-cabin school at short intervals and was self-instructed in elementary branches; moved with his father to Macon County, Ill., in 1830 and later to Coles County, Ill.; read the principles of law and works on surveying; during the Black Hawk War he volunteered in a company of Sangamon County Rifles organized April 21, 1832; was elected its captain and served until May 27, when the company was mustered out of service; reenlisted as a private and served until mustered out June 16, 1832; returned to New Salem, Ill., and was unsuccessful as a candidate for the State house of representatives; entered business as a general merchant in New Salem; postmaster of New Salem 1833-1836; deputy county surveyor 1834-1836; elected a member of the State house of representatives in 1834, 1836, 1838, and 1840; declined to be a candidate for renomination; admitted to the bar in 1836; moved to Springfield, Ill., in 1837 and engaged in the practice of law; elected as a Whig to the Thirtieth Congress (March 4, 1847-March 3, 1849); did not seek a renomination in 1848; an unsuccessful applicant for Commissioner of the General Land Office under President Taylor; tendered the Governorship of Oregon Territory, but declined; unsuccessful Whig candidate for election to the United States Senate before the legislature of 1855; unsuccessful Republican candidate for the United States Senate in 1858; elected as a Republican President of the United States in 1860; reelected in 1864 and served from March 4, 1861, until his death; shot by an assassin in Washington, D.C., April 14, 1865, and died the following day; lay in state in the Rotunda of the U.S. Capitol, April 19-21, 1865; interment in Oak Ridge Cemetery, Springfield, Ill.
Donald, David H. Lincoln. New York: Simon & Schuster, 1995; Findley, Paul. A. Lincoln: The Crucible of Congress. New York: Crown Publishers, Inc., 1979; Riddle, Donald W. Congressman Abraham Lincoln. Urbana: University of Illinois Press, 1957; Basler, Roy Prentice, ed. The Collected Works of Abraham Lincoln. 9 vols. New Brunswick, N.J.: Rutgers University Press, 1953-1955.